Purpose: To bring the health-care workers to the villages to deliver vaccines, birth control, TB treatments, Malaria testing, and all the other programs available to the local population. Description: In collaboration with the Ministry of Health, 10 times yearly APECA makes extensive trips to take Health Ministry nurses and technicians to visit remote settlements in the district. A campaign may last seven to twelve days, visit twelve to twenty five villages, and reach hundreds of villagers. During these campaigns the Ministry of Health employees are available to travel into the remote areas to deliver vaccination and/or malaria testing services. These government workers do not address the much-needed first aid and health education during these visits. When the villages are not reached by a vaccine campaign, there will be out-breaks of whooping cough and tetanus, and there will be a higher rate of respiratory deaths for children under five years of age. 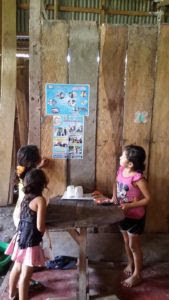 APECA has earned the trust of both the villagers and the government, facilitates the delivery of these services by organizing and setting up clinic sites in these remote communities, and by providing transportation, food, housing, and governmental interfacing where required. APECA coordinates general health and speciality campaigns, providing boats, crew, cooks, and village visit scheduling. Credentialed students and professionals are welcome to serve as volunteers on these one-two week trips that reach remote villages with immunizations. Professionals from the USA and Peru have joined in mutually beneficial service to enrich the skills and sensitivity of all involved in these project exchanges. The model for this process was initiated in 2003, when specialists from the University of Connecticut came to Peru to provide training in laparoscopic surgery, and offered an extensive surgical campaign. The twenty hours of training provided students with one unit of credit from the National University in Peru. The training was accompanied by a donation of instruments used in laparoscopic surgery. APECA continues to encourage these medical services and training projects, which benefit both the underserved in remote villages and the existing health system.